UPDATE (1/28/2012): Notes Plus is an app that has made some very excellent improvements recently, and I plan to add information about it soon. 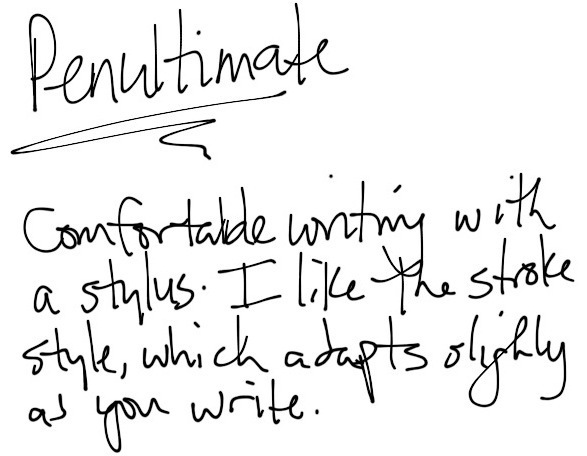 In the meantime, I'll just say that I may consider moving to it from my current favorite, Noteshelf. With all of the high-technology awesomeness of the iPad 2, one of the things that I was most excited about was the prospect of using it to take handwritten notes. There's probably something wrong with me. Somewhat surprisingly, I found that there aren't many apps on the iPad that do a good job of handling one's handwriting. Of seven that I tested, only two were really acceptable: Noteshelf (currently $4.99) and Penultimate (currently $1.99), with Noteshelf edging out the top spot in my eyes. I found that Noteshelf did the overall better job in accurately representing my handwriting, while Penultimate did a better job handling "wrist protection," which attempts to discern intentional writing with your finger/stylus from unintentional writing with your wrist or palm. Both apps feature their own types of wrist protection, but Penultimate makes an attempt at automatically detecting incidental hand-touches, while Noteshelf simply allows you to set aside a portion of the screen for your hand to rest. Although I usually just end up trying to keep my hand off the screen, since neither app is flawless in this domain (and if your wrist is really causing problems, the best solution is probably to wear a fingerless glove on your writing hand (as long as you're fine with the comments from your friends and co-workers (Michael Jackson and whatnot))). 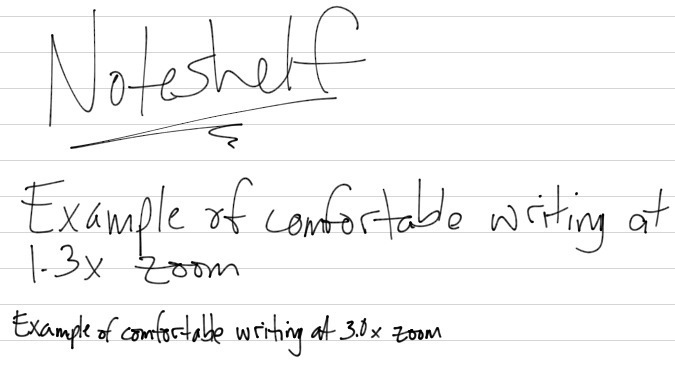 What I've found to be the most helpful handwriting feature of Noteshelf (which you'll see in other note-taking apps, but not Penultimate for some reason) is the "zoom," which lets you write smaller text in a more natural and comfortable way. This allows for flexibility in the amount of note-taking you can fit on a page, as well as for adding finer details when needed. Ultimately, I've found myself consistently gravitating to Noteshelf for my manual note-taking because it does the best job of representing my regular analog handwriting while offering solid tools that help me do what I need to do without much fuss. The extra $3 was well worth it to have something that works exactly as I want it to. That isn't to say that you'll be disappointed with Penultimate, which is totally capable (especially for its price), but depending on your needs and expectations, the little things can really make a difference sometimes.